I occasionally have fleeting thoughts of quitting [voice-over]. However, I quickly remind myself of 2 stories that keep me going. The first story is about a man who had been digging for gold for however many years. He finally gave up in frustration and sold his claim to the land to someone else. The next day, the new owner found a gold mine worthy of a king’s fortune 3 feet away from where his predecesor stopped digging. 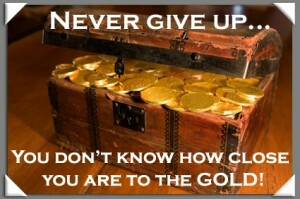 The moral is to never give up because you don’t know how close you are to the gold. The other story is definitely a true story, while the first one may be just a lesson. Mel Fisher was convinced that he would find the shipwreck of the Atocha, which was laden with gold, silver, emeralds and other precious items when it sank. His enthusiasm and positive outlook were infectious. Even when he endured personal tragedy like the death of his son during or as a result of a dive, he persevered. He did find a shipwreck, and I believe it was the find of greatest value ever recorded — something like $400 million bucks! He has a museum in Key West where many breathtaking relics are on display. I think it’s safe to say that he and his family live on Easy Street. I do feel more hopeful when I remind myself of these stories of perseverance against the odds. I am so anxious to get where I’m going that I find it difficult to enjoy and learn from the journey. I still feel like my marketing is scattered, and maybe I’m not targeting the right people. [My brother] talked about having an intermediate goal and steps plotted along the way. As for my next intermediate goal, how can I set them without being in complete control of the outcome? In other words, it’s hard to have goals when I have to depend on fickle, forgetful people to make a conscious choice to hire me. Maybe the better question is how do I distinguish myself from the 1000s of voice talent who are streaming out of every nook and cranny to set up shop on the web? To say people are fickle and forgetful is probably not accurate since they actually tend to be loyal to those they’ve used before by throwing more work their way. How do I break in and convince them that they should pick me as a relative newcomer? What is my competitive advantage? I think it’s my ability to sightread long passages and speak with proper inflection. I want to target narrations and audiobooks….Perhaps my next intermediate goal would be to re-do my audiobook demos. 1) While you need to have the big picture in mind, your progress will be incremental and sometimes may even seem non-existent. Think of the stories in this post and remind yourself that perseverance pays off! 2) Do something every day toward your goals, no matter how small. 3) Spend some time in quiet reflection to assess your skills, interests, and passions and how they might help move you forward toward your dream life. 4) Give up your need for control. Actually, very little in our lives is totally under our control. If you keep the end result in mind while you continue taking steps, the Universe will open pathways and create possibilities that you never even considered.